IndyCar racing has regained much of its popularity the last few years as a new star has emerged, Dario Franchitti. The Scotsman with an Italian name is well spoken, friendly and married to movie actress Ashley Judd. He’s a marketing bonanza. In 2010 Franchitti won his second Indianapolis 500, dominating by leading 155 of the 200 laps. In 2007 he won a 500 that was shortened 34 laps by rain. He now is a 4-time IndyCar champion, winning the past three national titles for the Target-Ganassi team. 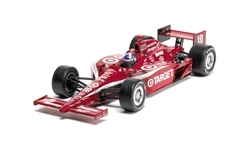 So the Franchitti 2010 Indy winner is an attractive driver/car combination and I’ve seen this model go for $45 to $50 on eBay. The lightweight IndyCars, which all ride on Dallara chassis, were powered by 3.5-liter Honda V8s for several years, until the 2012 racing season. The V8s created 650 horsepower for the sleek open wheel racers. At Indy they turned laps at 226+ mph and competed on both oval and road (sometimes street) courses around the U.S. This year the Indy car world gets a new Dallara chassis and most cars are powered by turbocharged Chevrolet and Honda engines. Greenlight’s model is an attractive reproduction of the Indy winner, with all the appropriate sponsor logos, from the main Target logo on the nose and sidepods, right down to the Huggies and Breathe Right stickers on the engine cover. Prominent on the air scoop above the driver’s head is the IZOD IndyCar series logo, the gas filler intake just below it on the car’s left side. 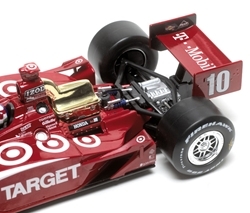 The paint job is excellent and the driver figure’s helmet accurately resembles Dario Franchitti’s helmet used on race day. There’s even a HANS device protecting his head and neck. The mirrors and rear wing look accurate too, and the engine cover is removable to reveal the HondaV8, again with appropriate labeling. The top of the engine cover and air intake are a reflective metallic material, much like on the real car. Where the car looks a little less realistic is in the cockpit and the black plastic suspension parts. Plus the tires have “Indy 500” and the Indianapolis Motor Speedway logo stamped on them. The real tires do not. You also can see seams in the plastic tires. Those logos are likely to satisfy IMS as these cars are sold as official track souvenirs. This model also was made to resemble the car after the race, with oil and rubber streaks up the nose and onto the sidepods, some collectors will like that, others not so much. While not to the standards of Carousel 1’s vintage Indy 500 cars, the Greenlight racer is a nice looking display car whose detail reflects its $60 mid-range pricing. It also comes in a spectacularly detailed box showing the car and Franchitti.